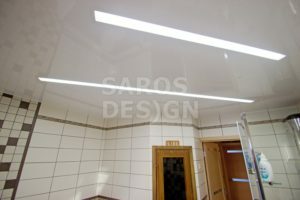 The SAROS DESIGN СOMFORT acoustic stretch ceilings featuring new micro-perforated materials are easy to manufacture and make a simple way to create acoustic comfort in a room maintaining the visual appeal of the room characteristic in case stretch ceilings. This acoustic stretch ceiling technology providing excellent noise absorption properties offers the possibility to save yourself from the annoying noise at minimum expense. Establishing a good acoustic environment in a room implies finding a solution of two interrelated challenges namely the challenge of room protection from outside noise (soundproofing) and assurance of high-quality sound transmission inside that room (acoustic absorption). Adequate outside noise soundproofing can be provided both by means of using more effective sound-proofing materials and by reinforcing wall and floor thickness. However, it is not quite the same thing in case of acoustic absorption. The echo effect in a room can only be suppressed with sound-absorbing materials. Wall carpets, fitted carpets and upholstered furniture are commonly used for that purpose. More acoustically advanced premises would have special acoustic panels installed. 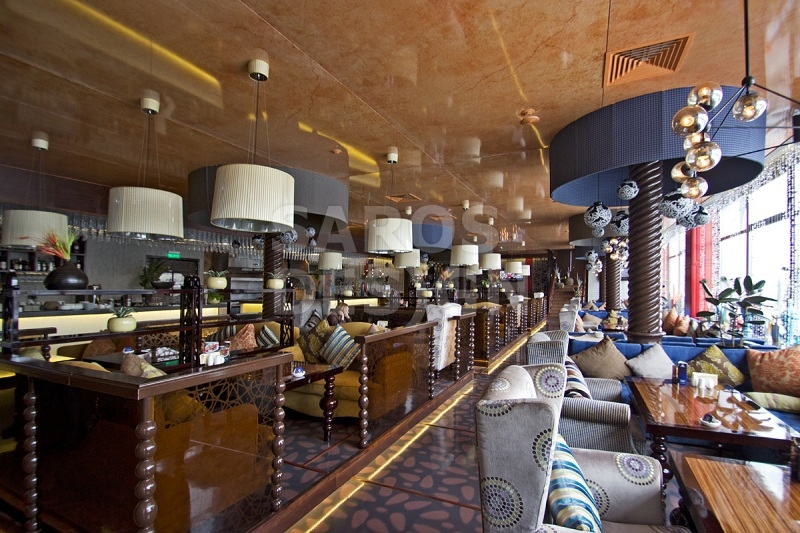 Very often, though, the expected visual appearance of the room would clash with the acoustic requirements. 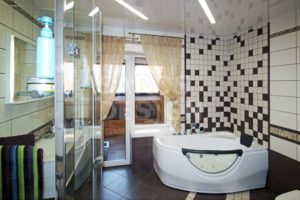 One cannot but agree that wall carpets and heavy window drapes will look inappropriate in some interior designs, and not everyone likes fitted carpets. So what to do? And what to choose – good looks and functionality? There is a solution to this rivalry. Any room has a free surface – its ceiling. Therefore, if we have the possibility to make ceilings with different acoustic absorption coefficients, we shall have the opportunity to create an acoustically balanced yet visually pleasing environment. A new SAROS DESIGN COMFORT line featuring micro-perforated PVC stretch ceilings offers this opportunity. 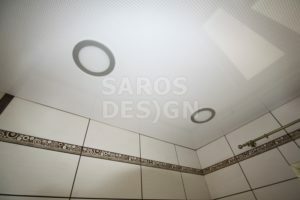 Sound waves that emanate from a sound source located in a room are partially absorbed by micro-perforated holes in the SAROS DESIGN COMFORT stretch ceiling. The air in the micro-perforations causes the obstruction of the initial sound, partially converting the sound waves into thermal energy and reducing their intensity. In addition, there is obstruction from the air between the micro-perforated panels and the back wall. As reflected sound waves continue to reverberate around the room, acoustic absorption continues and the reverberation time in the space is reduced. 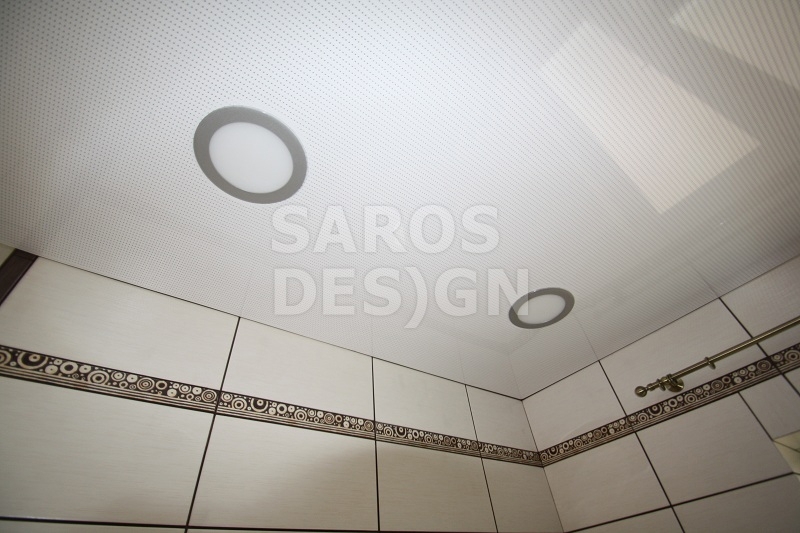 Micro-perforated PVC membrane SAROS DESIGN COMFORT stretch ceilings have been tested by Acoustical Investigation & Research Organization LTD (London), a UKAS accredited testing laboratory. According to issued Certificate No. L/3220, these ceilings’ have been assigned to absorption class D.
Acoustic ceilings are suitable for installation in any kind of interior including premises with high traffic and severe environment. Sometimes, in case of high noise pollution in a premise, an acoustic ceiling shall be installed together with sound-proofing mineral wool plates. 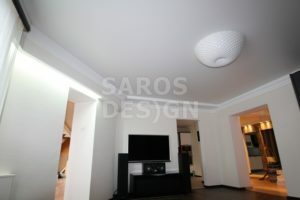 The sound-absorbing plates shall be attached to the load-bearing ceiling using individual tracks. This method ensures noise protection of the highest standard. Using both sound-absorbing materials and acoustic stretch ceilings at the same time improves the ceiling sound absorption class (up to the B class – maximum absorption).